Password: Not required for basic functionality. Contact RLE for advanced access. RLE’s Facilities Monitoring System (FMS) is a comprehensive monitoring system commonly used to monitor sensitive facilities, critical equipment status and temperature, and environmental sensors. Feature-rich and budget friendly, the FMS is used in data centers, labs, telecommunications facilities, museums, and many other facilities around the world. 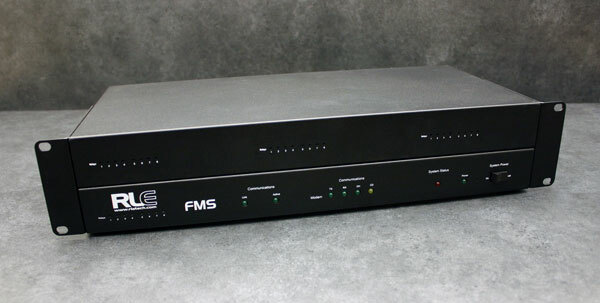 The FMS stores and displays all its own data and hosts its own web pages; you won’t need to buy additional servers or install software on your PC. 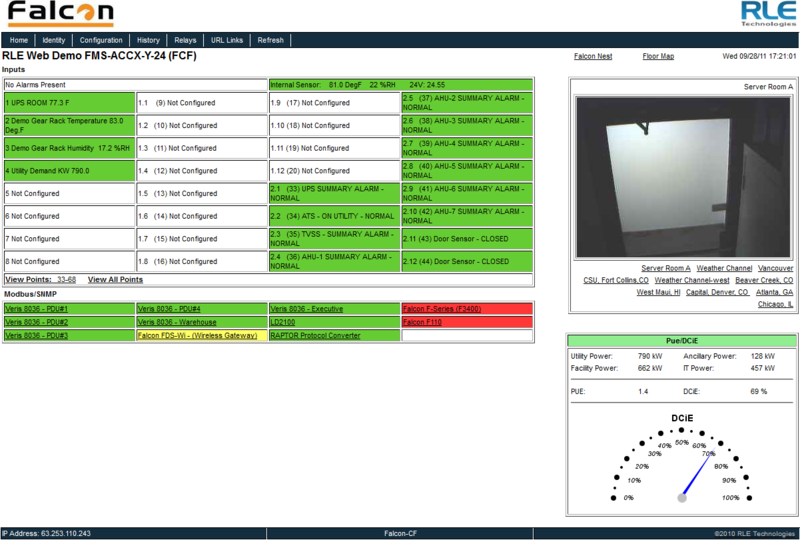 Great onboard features include data trending and extended logging, interactive graphical facility mapping, PUE/DCiE monitoring, and nesting, which allows one FMS to report conditions from a large collection of related FMS units. The FMS is engineered without any internal moving parts – no hard drive, no fans. This means no downtime, no lost data, and no scheduled maintenance. Designed to be vendor neutral, the FMS aggregates information from a wide variety of sensors and equipment and then displays it through an onboard web interface. 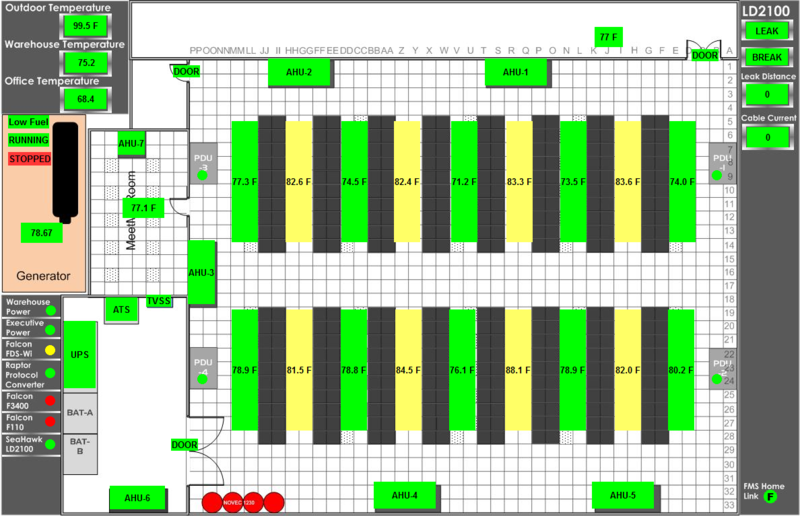 Does your facility have a larger BMS? No problem – the FMS also allows aggregated data to be pulled to other systems, all without additional servers or software. Firmware updates for RLE products are always free and are available on our website. Keep your device up-to-date and access new, expanded features and functionality by updating your device’s firmware with our latest release. 1U FMS: available as 24VDC or 48VDC – 24VDC Model: 24VDC (±10%), 1A max., power supply included; 48VDC Model: 36-72VDC, 0.5A max. 2U FMS: available as 24VDC or 48VDC – 24VDC Model: 24VDC (±10%), 2.5A max., power supply included; 48VDC Model: 36-72VDC, 1.25A max. EXP-A-24/48: 12 analog inputs (jumper selectable for 4-20mA, 0-5VDC or 0-10VDC) or digital normally open dry contact inputs (normally open ONLY! ; non-isolated, individual ground only); 8 Form C Relay Outputs, 1A @ 24VDC, 0.5A resistive @ 120VAC. 48V FMS can accept only 1 EXP-A-24/48 card. TCP/IP; UDP/IP; ICMP/IP; FTP; NTP; HTTP/HTML; SNPP; Telnet: IPv4; 1.1/4.0; up to 10 URL links to other IP addressable cameras/devices; webpages comply with Rehabilitation Act of 1973, sections 504 and 508, US Dept. of Education (website accessibility for computer users with disabilities). Trending of Analog Inputs: 244 entries per time frame, per channel. High, low, and average values logged over specific minutes, hours, and days. Extended Trending (Analog Inputs): 3,840 entries over 32 inputs, physical or over Modbus. Logging at defined, user-selectable intervals. Operating temperature: 32° to 158°F (0° to 70°C). If you have an older, buff-colored FMS, it’s time to upgrade. As of July 1, 2016, we will no longer provide free support for these older discontinued FMS units. Paid support will still be available after the July 1, 2016 date at a rate of $125/hour. Keep your FMS firmware up-to-date – the latest functionality and updates are just a click away! Did you know FMS firmware updates are available online, and best of all, they’re FREE! Click on the downloads tab to find the latest version of firmware, and refer to the user guide for complete firmware update instructions. Now it’s even easier to monitor the F200 as an egg in an FMS nest. Both the FMS firmware and the F200 firmware must be updated in order for the F200 egg feature to be completely functional: the FMS must be running firmware version 8.8.12 or newer, and the F200 must be running firmware version 3023, build 1420 or newer.